Fruits Juices is the first and only comprehensive resource to look at the full scope of fruit juices from a scientific perspective. 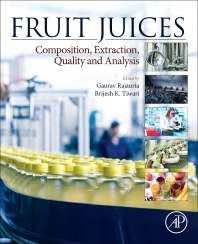 The book focuses not only on the traditional ways to extract and preserve juices, but also the latest novel processes that can be exploited industrially, how concentrations of key components alter the product, and methods for analysis for both safety and consumer acceptability. Written by a team of global experts, this book provides important insights for professionals in industrial and academic research as well as in production facilities. Gaurav Rajauria, M.Sc., Ph.D., is a Natural Product Chemist/Technologist at University College Dublin, Ireland. His primary research interest aims at mining and characterizing functional ingredients from underutilized marine resources and food waste-streams. His research also focuses on improving quality of meat, milk, eggs and other farm animal products by formulating feed with functional ingredients to refine animal diets. He advices number of masters, PhDs and post-doctoral researchers across multiple research projects. His research is published in various books and peer-reviewed journals, and is regularly presented at national and international conferences. Brijesh Kumar Tiwari, M.Sc., Ph.D., FIFST, FRSC, is currently a Principal Research Officer at Teagasc – the Irish Agriculture and Food Development Authority. His primary research interests relate to the investigation of green and sustainable solutions to food industry challenges. He is a fellow of Institute of Food Science & Technology (UK) and Royal Society of Chemistry (UK). He is also the Editor in Chief of Journal of Food Processing and Preservation and also part of the Editorial Board for Food Engineering Reviews.